Ontario, British Columbia and Alberta are the top three provinces where environmental professionals find job positions. In a series of blog articles, ECO Canada is analyzing those regions’ green initiatives and innovation approaches to learn why they stand out in the environmental sector and what that means in terms of opportunities. Global and national commitments to fight climate change and accomplish a low-carbon economy are two of the most important drivers for clean technologies in Ontario. Over the years, the province has been playing a key role to offer solutions while also attracting talent and investment. The region’s efforts are leading the way in diverse environmental scenarios, and numbers indicate so. The province’s cleantech strategies prioritizes areas related to energy generation, energy infrastructure, bio-products and bio-chemicals as well as water and wastewater. In addition to those primacies, policies and regulatory frameworks are also part of the picture to promote clean technology innovation. The Climate Change Mitigation and Low-Carbon Economy Act, the Environmental Protection Act, and the Clean Water act are some examples of ongoing progress. 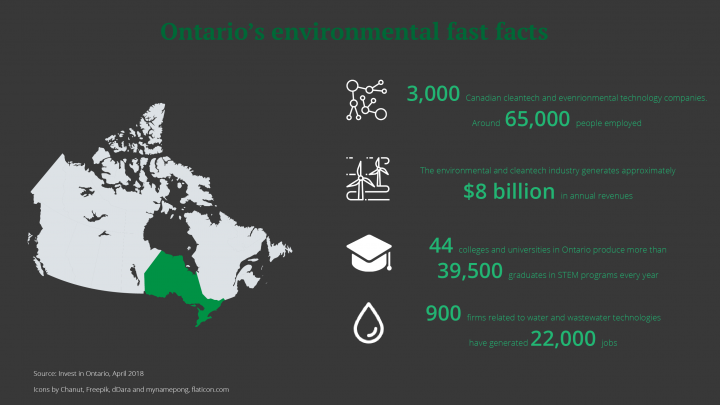 Environmental entrepreneurs are visible and highly active in Ontario. Climate ventures, a program launched by the Centre for Social Innovation, is a tangible example of how incubation, acceleration and collaboration empower initiatives. Climate Ventures not only offers a space to develop environmental projects, but also coaching and other advisory services to turn an idea into a solution. The process doesn’t stop there: key connections to leaders, funders, and investors to consolidate a strong result are also part of the equation. Another available stream this year is Climate Pilots, where participants compete to be selected and help Ontario’s small and medium businesses reduce GHGs while saving money. “Beyond the space and its accelerators, Climate Ventures is an opportunity for us to go deeper to respond to the many ways in which climate change and climate justice intersects with the social and environmental challenges our members tackle each and every day.” Barnabe Geis, Director of Programs, Centre for Social Innovation. Ontario is an exemplary case of how entrepreneurship can grow by building a community. While the province is strong at an industry level, the vibrancy of individuals with similar interests and common goals can find a space to meet other allies and make a difference. Stay informed and observe the clean technology sector, as there is economic momentum to do business, innovate, find job opportunities or start research projects in that area. If you’re considering an environmental career, keep an eye on STEM’s curricula that colleges and universities offer. There’s also potential to start gaining professional experience through wage funding programs. Learn about local centres or labs that foster environmental collaboration. That’s your chance to meet new people and jumpstart your projects. Review skills and knowledge requirements in the Natural Resource Management and Waste Management fields. Both are highly demanded in Ontario.